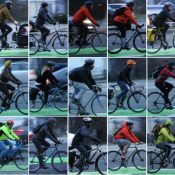 Ride-hailing giant Uber has responded to complaints of their persistent, dangerous, and annoying bike lane blockage behaviors outside of the Moda Center. Uber’s map showing new staging lot north of Broadway and pickup/dropoff zone on Winning Way. The problem, as documented by our friend Steve Bozzone in the above tweet, happens after Trail Blazer games (and we assume other big events) when Uber drivers block the bike lane on the south side of the Moda Center on NE Multnomah Street. 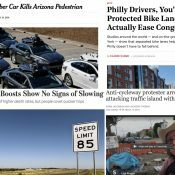 We joined with Steve and other readers to help raise a stink about this on Twitter recently and caught Uber’s attention. I engaged with them via private messages a bit and explained the problem and a possible solution. Then today another reader pointed us to an Uber blog post where they address the issue. As the exclusive rideshare partner of the Blazers, we have teamed up to make driving easier at this busy venue. We are excited to announce a new staging lot and pickup/dropoff zone after hearing your feedback. With thousands of fans attending Blazers games each week, we have created a staging lot with a first-in, first-out system to give you a better driving experience. 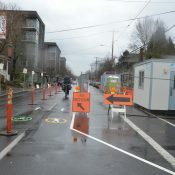 You will be able to queue up in our lot located on the corner of N. Benton Ave. and N. Broadway. 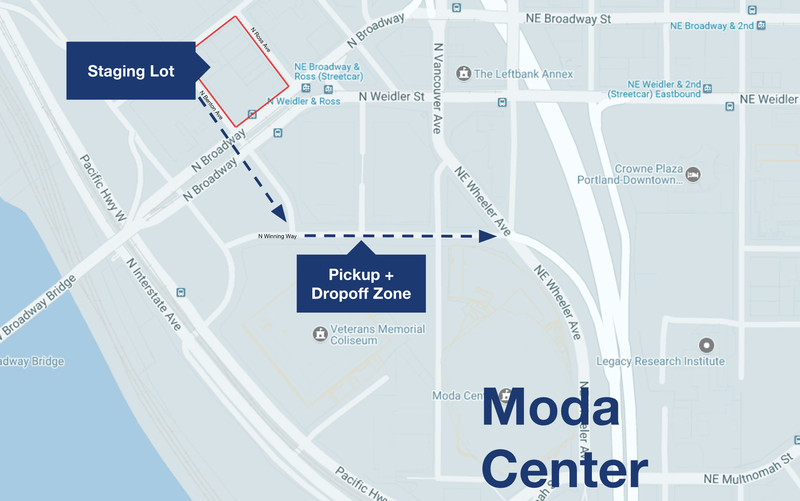 We have also moved the pickup and dropoff zone, which is now located along Winning Way. Once you receive a request, head across N. Broadway and make a left on Winning Way to find your rider between N. Benton Ave. and N. Center Ct. St. There will be police to help direct the flow of traffic across N. Broadway. Be sure to familiarize yourself with our staging lot and pickup/dropoff areas so you can easily connect with your riders on gamedays at the Moda Center. We hope these measures have the intended impact. Uber, if you’re reading this, we have many sources out there monitoring the situation and we’ll be in contact if the issue isn’t resolved. Thank you for responding. And… go Blazers! This will make the Lyft drivers happy as they will have the bike lanes on the south and east sides of the Moda center all to themselves. I guess this could be good for cyclists. These companies exploit their workers horribly though. This is a great step in the right direction. But we can’t let up the pressure. This doesn’t fix Lyft, taxis, and private vehicle drivers picking up friends. A PBOT engineer told me via email over a year ago that the bureau recognizes the need for an infrastructure fix to protect the bike lane here, yet nothing has been done. I’ve never observed parking enforcement here, and multiple requests to PBOT for info on whether/how often they’ve deployed Parking Enforcement here have gone unanswered. I’m glad something’s being done but there’s still more left to do. How about some of those better-quality plastic bollards? And the penalty for non-compliance is? They did this at the Moscone Center in SF, but the problem is still rampant. This is just the first step. We won’t let them off the hook until they stay out of our bike lanes for good. And we’re coming for Lyft and taxi drivers – and anyone else who does this. “Ride share” is really just a million terrible cab drivers with no regulation. These folks are causing congestion and are a hazard to us all. 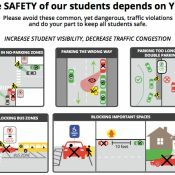 This is good work, and I’m glad people engaged to mitigate bad behavior, but these business models incentivize unsafe behavior. Agreed. They’re the most distracted drivers I encounter. that’s because 80% of them just moved here to become Uber drivers. they don’t know where they are 50% of the time, so they’re just staring at their GPS with complete cluelessness.. Reality is that clueless private drivers operating personal vehicles commercially can just add to the many problems of cars. Definitely some benefits to these ride-share systems, but hasn’t worked out for us as great as some thought it would. I’m going to guess that once they start using this regularly they will find that traffic at N. Winning Way and N. Wheeler is prohibitive – there is a parking garage exit and an I-5 entrance at this intersection and after games this area is very slow. how about a campaign to get the exceptions removed that allow drivers to be stopped in a bike lane for such purposes? The most grating thing about “ride sharing” isn’t that they are clogging bike lanes, causing traffic jams at midnight or providing sub-par service, it’s that they have proven our city government to be completely feckless and incompetent to enforce any semblance of order on the streets where they operate. Go downtown and just watch them drive all over the bus mall, turn the wrong way down one-way streets, park wherever. Indeed, this is not unique to Portland. Their drivers’ routine and flagrant disregard for our laws and general traffic congestion they cause leaves us all poorer will subsidizing their billion-dollar frat-bros in SF or wherever. While the rest of us play by the rules, and pay our taxes (even the arts one) I can count on zero hands the number of times I have seen a TNC car pulled over for breaking the law. These guys need to be held to a higher standard. They are profiting off our public streets and giving little to nothing in return. I still don’t understand why traffic law enforcement with massive fines can’t be self funding. If there is some sort of structural government issue that is preventing this maybe we should focus on political action to change this problem as our first priority. It is in some places. And if we are able to use automated cameras, it will be self-funding everywhere. might be because PDX has no police traffic division anymore…. When and why did the traffic division get axed? I would genuinely like to know. We seem to be spending more and more on public safety with each passing year. Congrats to actually making something happen. I’ve watched the clusterf__k since the Blazer season began as I regularly attend games which I walk to from NE PDX. It’s been horrible already with the pedestrian traffic, Lyft drivers sitting in the middle of intersection blocking traffic trying to get on I-5. Been waiting for a serious traffic incident. As a bicyclist I’ve especially worried when I’ve seen bicyclist trying to use the bike lane. Since Blazers are heavily promoting Lyft I’ve thought of contacting them my self. When I went to the game the other night & noticed all the cones protecting the bike lane I wondered what was up. So glad to see the improvement.